Accidents happen, and although every My Brest Friend nursing pillow comes "ready to go" with a slipcover in a print of your choosing, sometimes it pays to have a spare. 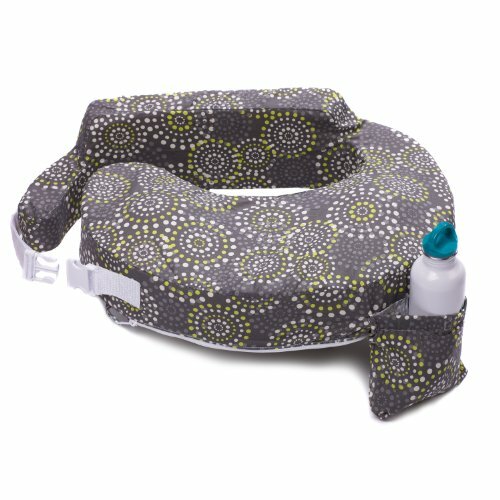 Many moms enjoy buying extra breastfeeding pillow slipcovers so that when spit up or leaky diapers strike, they can toss the original slipcover into the washer, and replace it with a clean, fresh cover without missing a beat – the silent release adjustable strap allows you to take pillow on and off quickly. Be prepared with an extra machine washable nursing pillow slipcover! Designed to fit all My Brest Friend wrap around breastfeeding pillows including the travel pillow, this machine washable nursing pillow slipcover comes in a bright and fashionable print. Super practical, the breastfeeding pillow cover includes a handy pocket to hold nursing pads, burp cloths and other breastfeeding accessories, and the 100% cotton design is soft against babies’ skin. My Brest Friend Breastfeeding Pillows have supported millions of moms around the world successfully breastfeeding their babies with nursing pillows and is also used in hundreds of NIC units and birthing hospitals across the country. Our patented wrap-around nursing cushions are the #1 baby breastfeeding pillow choice of lactation experts, as well as nursing moms. If you have any questions or problems regarding this Original Breastfeeding Pillow Slipcover, please feel free to contact us at info@mybrestfriend.com. PERFECT FIT: The 100% cotton imported slipcover fits all My Brest Friend wrap around breastfeeding cushions including the travel pillow. SPARE SLIPCOVER: Never get caught without a clean, fresh slipcover for your nursing pillow. This fabric cover fits over your breastfeeding pillow in seconds. SILENT RELEASE STRAP: The nursing pillow slipcover features an adjustable strap for quick on and off of pillow, with silent release - ideal for maternity pillow cover changes while breastfeeding. MACHINE WASHABLE: The easy-care nursing pillow slipcover is machine washable in warm water on a gentle cycle, so your breastfeeding cushion stays clean and fresh. If you have any questions about this product by My Brest Friend, contact us by completing and submitting the form below. If you are looking for a specif part number, please include it with your message. Nursing Pillow Cover in Mountains - Gray, Mustard, Mint - Handmade in the USA by Woodland Baby Co.